“I swear I will not reveal it to anyone. On my honor!” her husband replied. “I have an angel who watches over me and will not allow anyone to touch me,” she said. “You can only see him if you become a Christian,” she replied. She then sent him receive the Christian faith from a priest and when he returned home, on entering her room, he saw her praying in her chamber, and an angel by her side holding two crowns of roses. The Angel placed the crown on the head of Cecilia and her husband saying: “Keep these crowns with a clean body, for I have brought them to you from Paradise, and they shall never fade, nor wither, nor lose their savor, nor be seen but by those of pure heart. Cecilia preached had converted many to the Christian faith. 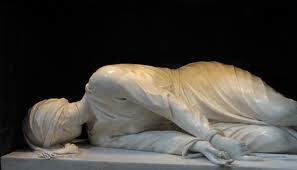 But one day, she was arrested, and condemned to death because Christianity was illegal in Rome at that time. An executioner sent to cut off her head struck her neck three times, but was not able to sever the head from her neck. He left her bleeding, lying on the floor unable to move. Crowds came to her, and collected her blood with napkins and sponges, whilst she preached to them or prayed. After three days she died and was buried. Seven centuries later, when her tomb was opened in Rome, the body of the Cecilia, was found perfect and incorrupt draped in expensive gold brocade and with the cloths soaked in her blood at her feet.